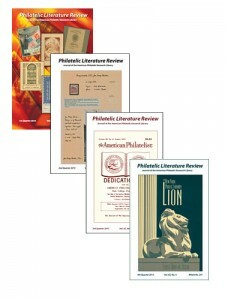 The Philatelic Literature Review, published quarterly and available by subscription, is one of the few journals concentrating on the publication of philatelic material. In addition to reporting on recent library acquisitions, the PLR provides reviews of books, catalogs and research papers. Ongoing features include publishing updates from new releases and research, to literature awards, and news of worldwide philatelic libraries. The regular price of a PLR subscription is $18. Sample the 2013 volume now for just $10+s/h. The 2012 volume is still available, too. And a special offer if you are going to be at APS Summer Seminar in June: stop in the APRL to purchase the 2012 or 2013 issues and save the cost of shipping, or start a new subscription to the PLR and receive the 2013 issues as your free gift!